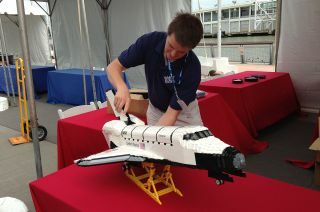 LEGO "Master Builder" Ed Diment attaches the tail to his LEGO model of space shuttle Enterprise before its debut at the Intrepid Sea, Air and Space Museum in New York, July 26, 2013. The New York City home of space shuttle Enterprise has a new model of the prototype orbiter made completely out of LEGO toy bricks. On Friday (July 26), Ed Diment, a LEGO "Master Builder," was at the Intrepid Sea, Air and Space Museum to reveal his latest creation, a 1/35th scale LEGO replica of space shuttle Enterprise. Diment designed and built the model based on photos and drawings using about 16,000 of the toy bricks. "It was a question of working out each shape — the nose, the wings and so on — and figuring out how you make those out of existing, normal, regular LEGO bricks anyone can buy in the shop," Diment explained. The 3.5-foot-long (1.2-meter) replica of the black-and-white test orbiter debuted as part of the Intrepid's second annual SpaceFest, now underway in Manhattan. The public celebration featuring NASA exhibits and astronaut appearances follows the reopening of the Intrepid's "Space Shuttle Pavilion" earlier this month. The Enterprise exhibit had been closed for eight months due to damage suffered from Hurricane Sandy. Like the real Enterprise, the LEGO space shuttle made a trans-Atlantic crossing before becoming a museum piece. Diment constructed the model, brick by brick, at his home in Portsmouth, England and then shipped it to New York. "It pretty much shipped in one piece," he said. "We had to remove the tail because it sticks up a bit too much." In 1983, NASA flew the full-size Enterprise to the Paris Air Show atop the same modified Boeing 747 jumbo jet that it used to perform the orbiter's atmospheric approach and landing tests in 1977. Although Enterprise never flew in space, it was the only shuttle in history to tour Europe, stopping in France, Germany, Italy and the U.K. before returning to the United States. Using 52,914 LEGO bricks, Ed Diment will assemble a mosaic of this photograph showing Enterprise flying over Central Park in 2011. In addition to building the Enterprise model, Diment is also overseeing the public’s assembly of a mural-sized mosaic this weekend, using thousands of LEGO bricks to recreate a photo of the space shuttle. The image, which was taken in 2011, shows Enterprise, flying atop NASA's 747 carrier aircraft, as it soared over Central Park. Visitors to the Intrepid are invited to help Diment build the mosaic using 52,914 LEGO pieces. "It breaks down into 784 squares and each person builds his own square following a pattern and using one-by-one bricks of various different colors," he described. This is not Diment's first collaboration with the Intrepid. A professional LEGO builder whose portfolio includes brick replicas of London's Olympic Stadium (with 10,000 LEGO minifigure spectators) and a 9-foot-tall (2.7 meters) Osprey "Audrey" women's handbag, Diment previously built a 22-foot-long (6.7 m), 250,000 brick model of the USS Intrepid aircraft carrier. The 550-pound (249 kilograms) LEGO model of the Intrepid was displayed on the World War II ship-turned-museum in 2011. Diment's shuttle Enterprise and the mosaic mural will be on public view through Sunday (July 28). According to the Intrepid, the two LEGO creations will then be placed into storage at the museum while officials decide the best way to display them. The LEGO Enterprise is the not the first space shuttle to be created out of the toy bricks. Diment earlier built similar models of Discovery and Endeavour for private collectors. "The challenge with Enterprise was that we had to do the [tail]cone on the back," Diment said. Other LEGO shuttle models have been assembled for the LEGOLAND parks and the Denmark-based company has released 10 different shuttle toy construction sets over the past two decades. Two LEGO-built shuttles also launched on the real orbiters to the International Space Station in 2011. Click through to collectSPACE.com to see more photos of LEGO “Master Builder” Ed Diment’s space shuttle Enterprise model at the Intrepid Sea, Air and Space Museum.